Kilts as we know them today, would not exist if it were not for army kilts. The reason I say that is that the wearing of kilts and all tartan was banned in Scotland after the battle of Culloden. The"Dress Act"of 1746 made it illegal to wear the kilt, the only exception being the army uniforms of the Scottish regiments. The reasoning behind this law was the suppression of Highland culture, and the penalties for breaking that particular law were severe, six months imprisonment for the first offense, and seven years transportation for the second. The ban remained in place for thirty five years, during which time the kilt was largely forgotten in the Scottish Highlands. The only way for young men to wear the kilt was to join a Scottish regiment, something the British government of the time was actively encouraging. In fact they formed many new Highland regiments, which were sent to fight in North America and India, these different regiments were given their own tartans as a means of identification, and in so doing they greatly reduced the threat of further rebellion at home. These Scottish regiments fought in many wars during the next two hundred and fifty years, and their kilts distinguished them from other Scottish regiments of the British army. Below you can see a photo of three soldiers wearing their regimental kilts. 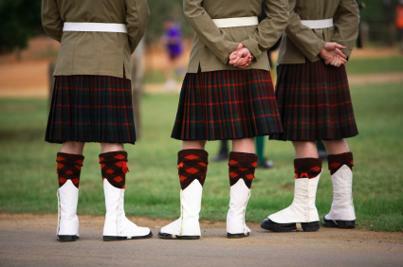 How do army kilts differ from the kilts that you or I buy from our kilt maker? Well there are several differences, and the first is the weight of the cloth used in the making of the kilt. The average weight of a kilt worn by a civilian is either 13 oz, or more normally 16 oz, these weights are given in ounces per yard. The weight of a Scottish soldiers kilt is either 18 oz or the more normal 21 oz, these heavier cloths make the kilt much more hard wearing. Another important difference is the pleating of the kilt, there are two types of pleats, knife pleats and box pleats. The knife pleat is a simple fold, where as the box pleat is bulkier as it is two knife pleats back to back. Almost all civilian kilts are made with knife pleats, while with military kilts both are used, depending on the regiment. And these regimental traditions are carried on today in the newly formed Royal Regiment of Scotland, which is an amalgamation of former regiments. Pleats can be arranged in two ways. They can be pleated to the stripe, this is where a stripe from the tartan is selected and the cloth is folded, with the stripe running down the center of each pleat. This is the method used by the military, and is often referred to as military pleating. It is also the pleating favoured by most pipe bands. The second method is called pleating to the sett, where the fabric is folded so that the pattern is repeated all the way around the kilt. This is achieved by taking up one full set in each pleat, thus making the kilt look similar from both front and back. This is the way most civilian kilts are made. Many of the traditions associated with the kilt originated with the military, one of the most famous being the bagpipes, another is the kilt pin and perhaps the most talked about of all, what's under the kilt. If you follow the link you can see for yourself, and you will notice the photo is of three Scottish soldiers. So as you see, we have the Scottish regiments to thank for the survival of the kilt. Ironically the British government of the day who had outlawed the wearing of the kilt in Scotland assured not only its survival, but helped to make it arguably the most famous National Dress in the world.